Have I told you how much I love Kpop music? I am a big fan of BigBang, 2ne1, BTS, GOT7, SNSD and more. I am a big fan of their work ethic and their dedication to their craft. I feel like Korean set the a lot of trends last year especially when it comes to beauty products. Remember the whole BB and CC Cream scene?? Now over the years that I've been following some of Korea's best Kpop Groups I notice one thing. Their skin are sooooo insanely good. No sign of aging, big pores or acne marks. I don't blame anyone to be a little jealous of the Korean skin. So today I decided to unravel how the Korean Skincare regimen works and how we can adapt it to our own routines. Mind though that genes and environment play a vital role when it comes to beautiful skin. Following the regimen doesn't guarantee that your skin will be like Sandara Park's but it will definitely improve your skin's condition over time. I'e talked about the Perfect Skincare Routine on a past post here in my blog and most of the step was taken from the Koreans. Their skincare routine is a process that will make your skin look hydrated, treat early signs of ageing plus make your pores appear smaller. Koreans are big fan of Double Cleansing. They first remove their makeup through cleansing oil and followed by a foaming cleanser. This way the face is cleansed thoroughly but not overdry. Koreans are big fan of face masks. These masks improve blood circulation, improve the condition of the skin and give nutrients to it. Toners help balance the pH level of the skin. It also removes remaining dirt on the skin that the facial wash didn't remove. Serums or essences are much stronger treatment to the skin. It boost the skin's hydration. Though we have what we call the aegyosal where puffy eyes are considered pretty, dark and saggy looking eye bags are a bog no-no. The use of eye creams are very much important on Korean Skincare Regimen. Moisturizers are helpful to keep the face hydrated. Those with SPF are must-haves for they also protect the skin from harmful rays of sun. Face masks are big part of what makes Koreans look good. It is a much simpler and less costly kind of facial for the everyone. Now choosing the right kind of faces is important. It all depends on the problem you want to treat and the result you want to see. If your goal is to have whiter skin the use masks that are licorice and/or lemon infused. If you are looking for a moisturizing mask then try with aloe vera or has hyaloronic acid. For a brighter looking skin, masks that have citrus extract creates better result. It is not just about what they use in the face that makes their skin glow, Koreans also mind what they put on the inside. Vegetables and spices are rich with antioxidants that make Korean younger looking. To achieve supple skin, Koreans are also a fan of drinking more glasses of water than carbonated drinks. The use of sunscreen is one last important factor that makes Korean skin great. Sunscreens help treat spot and avoid pigmentation on the skin overtime. This assure that the face will stay as young and beautiful even with the harmful effect of the sun. I implemented sunscreen last year and became such a huge fan. It revolutionized my skincare routine and I just can't go out of the house without applying it. 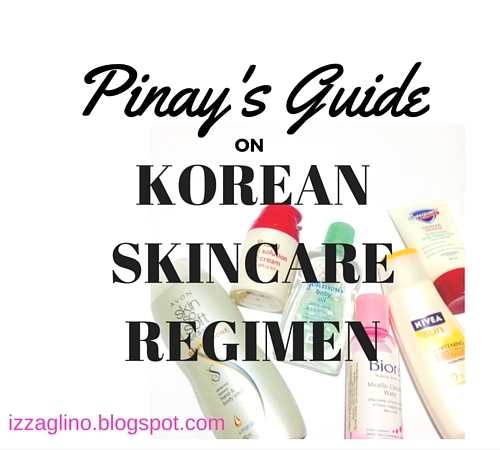 Here's how I incorporate the Korean Skincare Routine on my personal skincare regimen. I am huge fan of masks and try to use them at least every other day. My favorite will be the masks from Watsons and/or Beauty Buffet. Before I became loyal to Olay Total Effects 7-in-1 Pore Minimizing Toner I also became fan of Nivea Refreshing Toner, Belo Whitening Toner in Pink and Bench Perfect Skin Whitening Toner. Though serums are of higher price than regular moisturizers I was able to find a cheaper alternative. Bench Perfect Skin Whitening Serum works well too. Below are the links for my in depth review on the Bench Perfect Skin Kit plus the video of how I use each product. Currently I am using the Olay White Radiance Serum. I hope this blog post helped you identify the key steps and ingredients that make Korean skin good. Remember that it will take time before the results can be felt. Also it takes discipline to follow the regiment for it to be successful. Try incorporating the Korean skincare regimen slowly on your current setup. What can you say about the Korean Skincare Regimen? Pinay's Guide: All About Primers!